VANCOUVER, BRITISH COLUMBIA--(Marketwire - Jan. 21, 2011) - Prodigy Gold Incorporated (TSX VENTURE:PDG) is pleased to announce results from the recently completed diamond drilling program at its Milestone Gold Project located in the Beardmore-Geraldton gold belt of northern Ontario. Prodigy Gold has received results from 35 diamond drill holes totaling 10,857 metres that targeted a 1,200 metre section of the Klob Lake shear zone. Highlights include drill hole MS10-69 that intercepted 81.7 metres grading 0.51 gpt gold and drill hole MS10-77 that intercepted 23.0 metres grading 1.47 gpt gold. These drill intercepts, coupled with the other recently completed drill holes, continue to affirm the bulk mining potential of the Milestone project. A table of significant drill results is provided below; complete drill results can be found on the Milestone page at the Prodigy Gold web site. Assay results for the final eight drill holes (MS10-80 to 87) are pending. Exploration and drilling results to date have greatly increased our geologic understanding of the Milestone gold system. 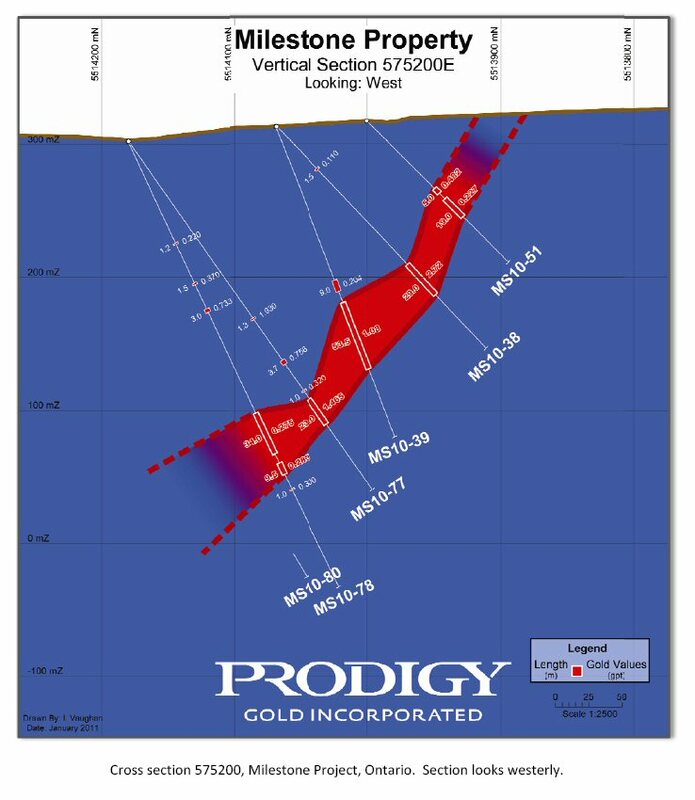 Prodigy Gold data indicate that gold mineralization at Milestone is concentrated along the easterly striking Klob Lake Shear deformation zone and parallel structures. These structures are cross-cut by north trending faults that are preferentially localized within fine grained gabbro intrusive rocks. Within these structural intersections, the deformation zone is intensely quartz veined, deformed and folded. Quartz veining and silicification is accompanied by pyrite, chalcopyrite and occasional occurrences of visible gold. Sulphide formation is thought to be derived through the destruction of magnetite within the gabbro rocks which are often better mineralized with respect to gold-bearing quartz veins. Gold mineralization at Milestone continues to show remarkable continuity and extends from the surface to depths of greater than 280 metres and remains open (see cross section above). Following receipt of assays from the remaining eight drill holes, Prodigy will begin planning the next phase of diamond drilling at Milestone. Drilling will concentrate on the known area of gold mineralization and also along multiple parallel structures on the Milestone property. About Prodigy Gold: Prodigy Gold Incorporated (TSX VENTURE:PDG) was created by unifying the assets of two Canadian Junior exploration companies: Kodiak Exploration Limited and Golden Goose Resources Inc. Prodigy is currently evaluating the Magino Mine project in Ontario as an open-pit mining opportunity with the potential for deeper, higher grade gold production. The company is producing a new NI 43-101 compliant resource estimate for Magino that will serve as the basis for a Preliminary Economic Analysis (PEA), establishing the economic parameters of an open pit mining operation. The PEA is expected to lead to a full feasibility study in 2012. Bringing the Magino Mine project through the feasibility process and towards production, coupled with the resource potential of our Beardmore-Geraldton exploration properties including Milestone, will be the catalyst to Prodigy Gold's growth and will build shareholder value: Today's Discovery, Tomorrow's Future. The geological information for the Milestone project has been reviewed and approved by Tom Pollock, Prodigy Gold's Vice President - Exploration, who is a qualified person under the definitions established by National Instrument 43-101. Prodigy Gold QA/QC procedures are as follows: Prodigy Gold channel samples are 5 cm wide cut perpendicular to the strike of the vein and/or shear zone from mapped alteration in the footwall continuously through the vein and/or shear zone and into mapped alteration in the hanging wall. Channels are cut with a motorized circular saw to a depth of 10 cm and removed with a hammer. Channel sample spacing is nominally every 20m along strike, dependent on outcrop size and geometry. Sample intervals are selected according to geologic contacts and visible mineralization, placed into a sample bag, and shipped to the assay lab for quantitative analysis of select elements. Prodigy Gold drill cores are split down the center with a typical table feed circular rock saw or are split with a hydraulic slitting device. Sample intervals are selected according to geologic contacts, visible mineralization, and alteration, placed into sample bags and shipped to the assay lab where they are quantitatively analyzed for select elements. Drill cores are boxed, covered, and sealed at the drill rig and moved to the Prodigy Gold logging and sample preparation facilities by Prodigy Gold personnel. Prodigy Gold angle core holes are directed perpendicular to the mapped dip of the vein therefore reported drill hole intercepts approximate70 to 100% of the true thickness of the vein. All Prodigy Gold samples are currently being assayed by Chemex ALS, 2090 Riverside Dr, Timmins, ON P4R 0A2. Blank and standard samples are routinely submitted with all sample batches sent to the lab for assay. Samples are routinely sent to other labs for additional checks. This release may contain forward-looking statements or statements that relate to programs that involve a number of risks and uncertainties. Actual events or results could differ materially from the Company's expectations and projections.